The world’s energy demand is expected to decline from 2035 onward, according to global quality assurance and risk management company DNV GL, which published its most recent Energy Transition Outlook 2018 recently, and which predicts that this will result in a reshaping of energy investment trends. DNV GL published its new Outlook last week and set about highlighting several aspects of its mammoth report, including its findings of how the decarbonization of the global energy mix will impact global spending on energy. Specifically, according to DNV GL, global spending on energy — as a proportion of economic output — will slow dramatically as the world’s energy demand peaks in 2035 and slows thereafter, while GDP will continue to increase. 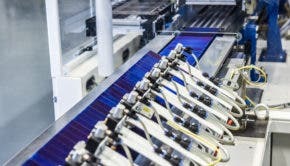 Specifically, DNV GL expects that the world will be spending 44% less on energy by 2050 as a percentage of GDP due in large part to the rapid electrification of the energy mix due to the increase in renewable energy technologies, and the inherent increase in efficiency that stems from these new technologies. Conversely, as renewables increase their share of the energy mix and investment in energy declines, fossil fuel spending will drop by around a third through 2050. All these factors will result in oil peaking in 2023 and natural gas becoming the largest single source of energy generation from 2026 accounting for 25% of supply by 2050 — coal, according to DNV GL, has already peaked. Thus, by mid-century, fossil fuels and renewable energies will equally share the energy supply, with fossil fuels falling from its current level of 80%. These trends will naturally impact energy investment, and according to DNV GL investment will fall to 3.1% of global GDP, down from its current level of 5.5% of global GDP. Spending on fossil fuel will fall by around a third to $2.1 trillion. Renewable energy, however, will see investment levels triple its current levels to $2.4 trillion, while grid expenditure will increase to $1.5 trillion. DNV GL’s Outlook comes at the same time that independent financial think tank Carbon Tracker published its own analysis predicting that fossil fuel demand will peak some time during the 2020s — most likely 2023. This is in stark contrast to forecasts from the likes of British Petroleum (BP), the Organization of the Petroleum Exporting Countries (OPEC), and the International Energy Agency, each of whom believe fossil fuel demand won’t peak for another generation or so. DNV GL’s forecast, therefore, pairs well with that of Carbon Tracker, but where are the others diverging? “The notion of peak energy is an important one, and that is why DNV GL highlights this as a key finding in our forecast,” explained Sverre Alvik, Programme Director of the Energy Transition Outlook. “DNV GL sees energy efficiency improvements being so strong that it from the 2030s onwards outpaces the economic growth that globally gradually will reduce towards around 2%/yr. Behind the strong efficiency improvements is a strong belief in electricity taking over as the dominant energy carrier, more than doublings its share to 45% of final energy demand in 2050. Further, we believe in the continued development and cost competitiveness of PV and wind, with learning rate of 18% for PV and 16% for wind to continue throughout the forecast period. This leads to PV being 40% and wind 30% of global electricity mix in 2050.